* Apple MFi certification ensures complete charge and sync with Apple devices and all iOS versions, same as original Apple lightning cables. * Extra Short, Extra Durable: 1ft/14inch(35cm) of flexible cord lets you connect at close proximity without getting tangled. * Total length: about 14inch(35cm). If have any problem, contact us Mon-Fri 9:00AM-5:00PM. Emails answered within 1 business day. If you frequently need to charge your Apple devices or sync data from one gadget to another, this short lightning cable should be the perfect for you. It's great for using in the home, the office, or even on the go. 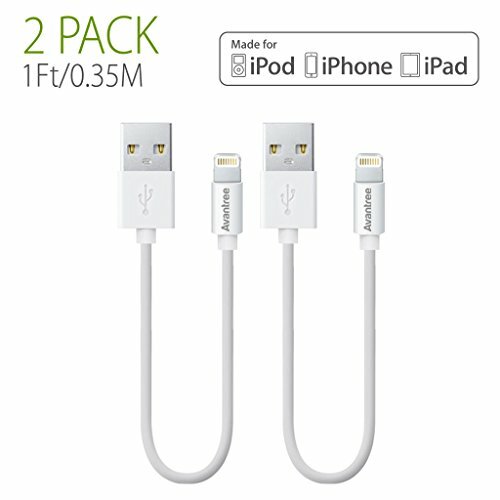 Just like the original Apple Lightning sync and charging cables, this short lightning cable is Apple MFi lightning cable, which means that it is compatible with charging and syncing Apple devices, including all iOS versions. It's so simple to use too! Just connect your Lightning to USB cable to your iPhone, iPad, or iPod and then connect to your USB connector into your charger or computer. Your gadget will then be ready to charge or sync - it's that easy! With a variety of Apple gadget cases available, it's important that your MFi lightning cable is compatible. Well, this MFi lightning cable's compact lightning connector head works with nearly all cases on the market! To prevent troublesome wires tangling when you are syncing or charging your Apple devices (especially when plugging in near other equipment), this Lightning to USB cable is designed to be extra short and extra durable with 1ft/0.35m of flexible cord enabling you to keep your gadgets tidy while you charge and sync!